Just because winter is nigh, doesn't mean you can no longer enjoy an al fresco drink (or two). 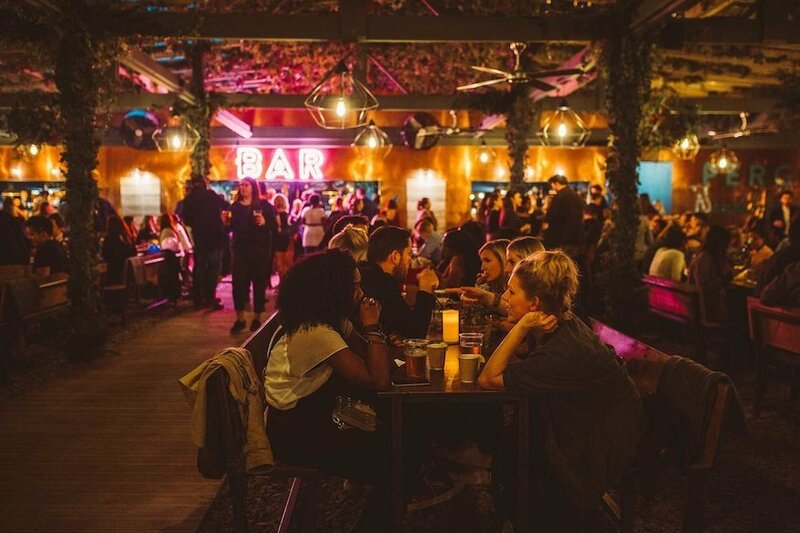 Here's a roundup of our favourite outdoor and rooftop pop-up bars (complete with heaters, fire pits and festive food) to warm your cockles in the winter months. We've already told you about Shoreditch's Moulin Rouge themed rooftop bar in some detail, so we'll leave it at this: absinthe cocktails, cheesy raclette, windmills. Lady Celeste Winter Rooftop, Queen of Hoxton, 1-5 Curtain Road, EC2A 3JX. Open until April 2019. Free entry, although the rooftop may occasionally close for events. Check the website before you go. Selfridges' rooftop restaurant and bar has changed hands a few times over the years, but the wintry welcome and amazing views overlooking Oxford Street remain a permanent feature. This rooftop oasis is open year-round, but from October a winter wonderland emerges complete with fairy light strewn Christmas walkway — an Instagrammer's dream. If you're after food, Italian produce and fresh ingredients take centre stage. Or simply wrap up warm with a festive cocktail in hand on the al fresco terrace. Plus, you get to use the super-speedy express lift from the ground floor of the store, all the way up to the roof. Wheeee! Just a few rooftops away on Oxford Street is The Gardening Society at John Lewis. Seasonal food comes courtesy of baked goods experts MYPIE's pop-up restaurant, which will warm your cockles with hearty beef pies, sweet potato pies, chicken and chorizo pies, and... more pies. Private dining cabins are available to hire for the ultimate winter hideaway, with seasonal cocktails available from gin maestros Sipsmith. 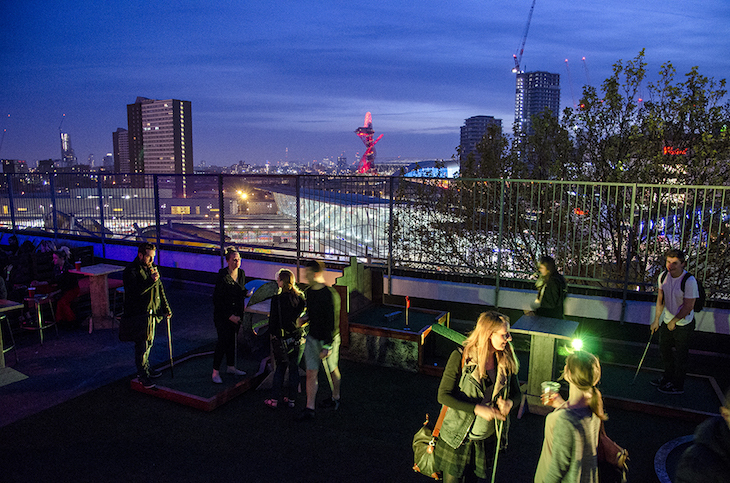 If the promise of a hot gin cocktail isn't enough to lure you in, perhaps a rooftop skating rink will. It's tiny, but it might just have the best view of any ice rink in London. Wreath decorating workshops every Tuesday until Christmas complete the line up. 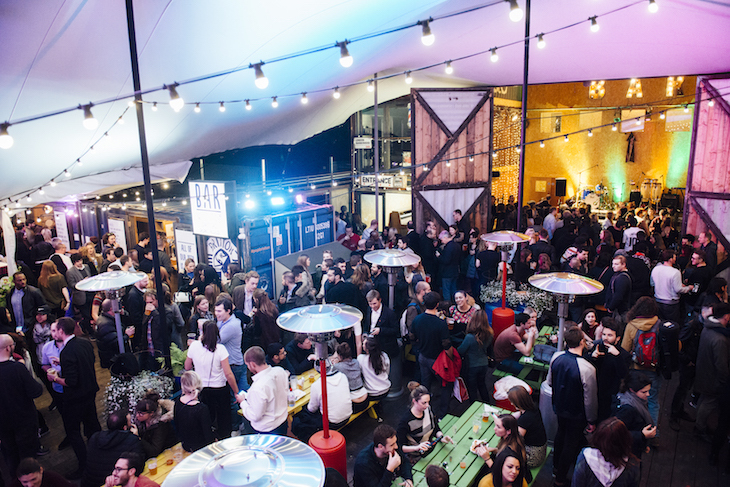 Winter pop-up Jimmy's Lodge is making a return to London's South Bank this winter. Admire views of the Thames with a steaming drink in hand from the riverside lodge, abate your hunger at the upstairs dining room, or settle down for a cosy evening in one of their much-loved private igloos (be warned, they do carry a minimum spend of £600). It's all Alpine-themed so expect oozy fondues, sizzling steaks and warming cocktails ranging from traditional mulled wine to the more adventurous hot apple mojito. Just a few minutes' walk away, Southbank Centre offers yet another cosy Christmas contender. 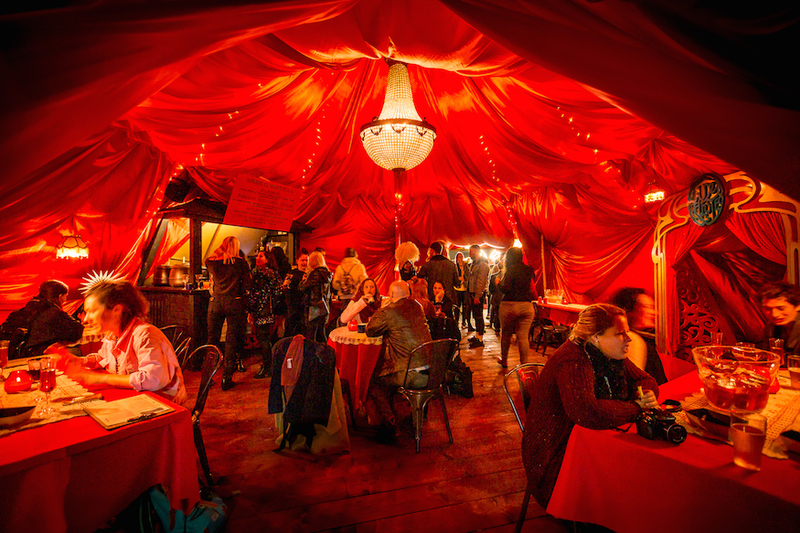 The Circus Bar sits in a charming tent out the front of Royal Festival Hall, kept warm by fire pits, Christmas cheer and an endless supply of spiced winter warmer drinks and filled sandwiches, hot from the oven. The ice rink at Tobacco Dock's Skylight Rooftop. As Londonist's Ruth Hargreaves says, "Once upon a time all we asked of our rooftop winter bars were some pleasing views and a warm cocktail or two to keep the frostbite at bay. Now it's all themed decor, hidden entrances, guest residencies and, in the case of Tobacco Dock, a full-blown rooftop ice rink." 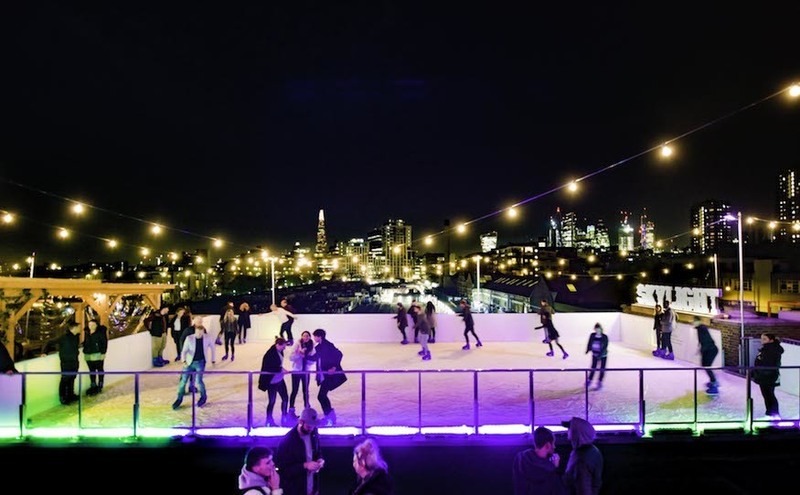 Yes, Skylight Rooftop has a hidden ace up its sleeve in the form of a decent-sized ice rink with views over east London and across to The Shard. And that's not all. Rent an igloo, try your hand at ice hockey, sup a rum punch sharing pitcher and get stuck into some Greek fast food. A riverside beach known as Neverland during the summer months, when winter closes in, Winterland comes to the fore. Then it's goodbye deckchairs and hello chairlifts as the space transforms into an outdoor ski resort complete with activities, cosy fire pits and bars aplenty. In between belting your heart out in a karaoke booth or showing off your 'sporty' side at the beer-pong tables, get a drink at the Moose Bar which serves up cocktails based on the herbal Austrian spirit, Moose. 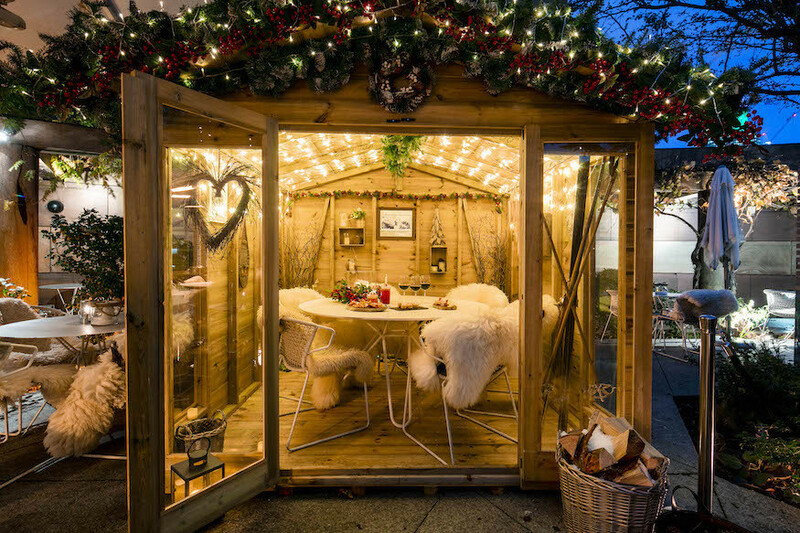 In plans that sound too twee to be true, Gordon Ramsay's York & Albany restaurant in Camden has a Gingerbread Winter Cabin in its courtyard. Indulgent food options include pheasant terrine, pumpkin soup and full-blown sirloin steak, which can all be washed down with winter cocktails such as the Gingerbread Latte-tini. You'll be provided with blankets to keep you warm, candy canes to keep you sweet, and you can even pre-order a giant gingerbread to decorate while you enjoy your wintry surroundings. 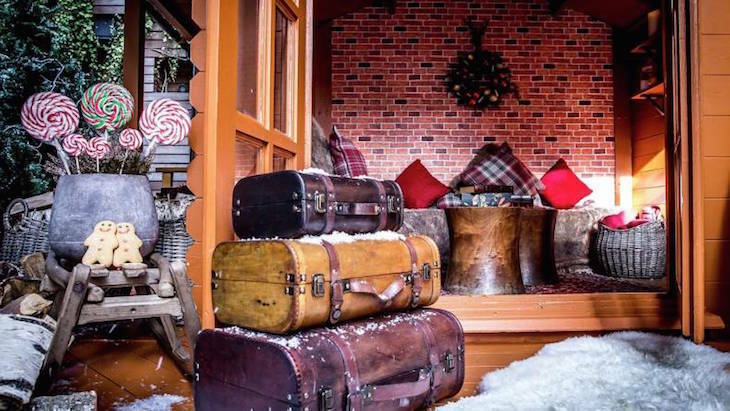 Prepare for a tartan invasion this winter at Churchill Bar & Terrace's Scottish-themed festive pop-up. It's a mighty classy affair with pine trees, roaring fires, faux fur throws and Highland-inspired cocktails aplenty. As you might imagine, Scotch whisky features highly, paired with such delights as chestnut tincture, jasmine tea and lavender smoke. Oh, and scotch eggs to nibble on too. Obviously. Churchill's Highlands Hideaway, Churchill Bar & Terrace, 30 Portman Square, W1H 7BH. Mrs Fogg's Winter Terrace at Broadgate Circle. Tucked around the back of busy Liverpool Street station, you'll find a very merry surprise this winter in the form of 300 snow-capped pine trees at Broadgate's Winter Forest. 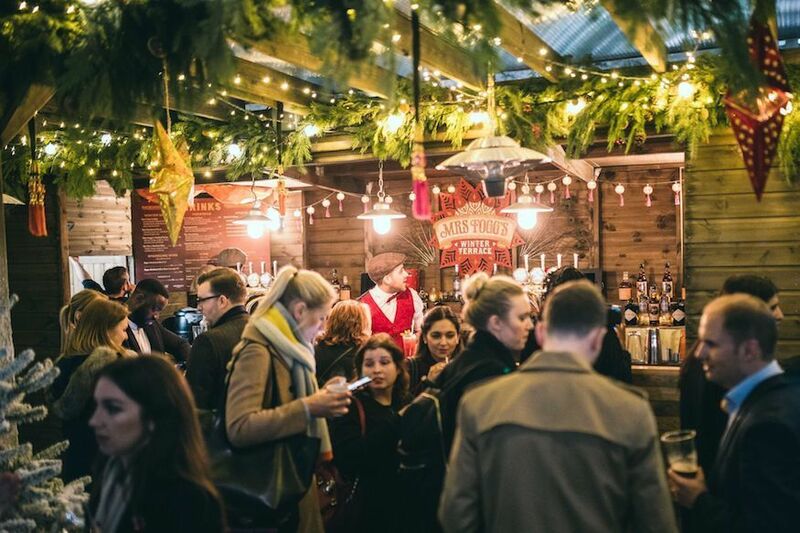 Live music, craft sessions, quiz nights and even a few visits from Father Christmas himself will pop-up throughout the festive months, so there's plenty to do in between supping hot toddys at the resident bar, Mrs Fogg's Winter Terrace. Swing by on a Wednesday evening and you may even be treated to a Christmas carol singalong. Galvin HOP in Spitalfields partners with Pilsner to launch a winter garden. Adjacent to the restaurant, the Bavarian-style beer tent is available for public and private hire and sees blanket-strewn tables nestled in between Christmas trees. The bar will feature a 250 litre copper tank serving fresh unpasteurised Pilsner Urquell, delivered weekly direct from the Czech Republic. The menu will feature bar snacks and, always a welcome sight, Welsh rarebit. Curling atop Roof East in Stratford. Busy shopping centres are usually the stuff of Christmas nightmares, but the ski lodge pop-up atop Stratford Shopping Centre is a dream come true. Yes, there are hot cocktails. Yes, there are private-hire igloos. Yes, there are street food stalls. But you also want to come here for the opportunity to curl, the sport known as bowling's wonderfully weird winter cousin. In fact, this winter's theme is 'Curl Runnings', a nod to the 25th anniversary of the classic 'Cool Runnings' film, which means you can expect tropical-style decor and Jamaican-inspired drinks. 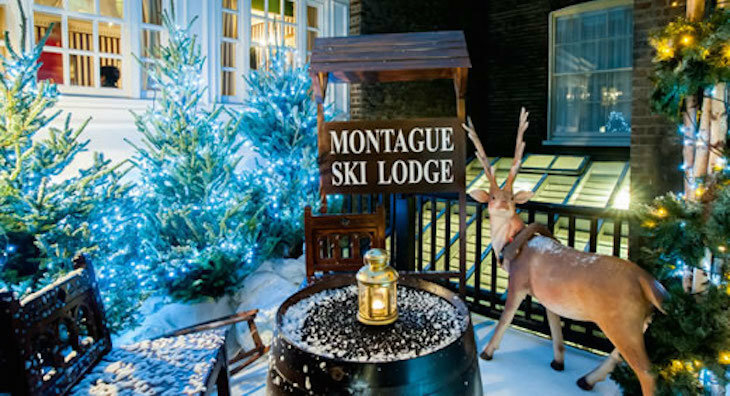 The Montague Hotel in Bloomsbury is transforming its deck into a ski lodge complete with pine trees, falling snow and snowmen. Pick from a choice of 12 drinks at the bar, including mulled wine, flavoured vodkas and hot chocolate cocktails. 'Ski resort glamour' is the promised inspiration for this year's Lodge d'Argent, the rooftop winter pop up at Coq d'Argent near Bank. Expect rustic wooden walls, fur blankets and winter greenery combining to create a fairy tale backdrop for sipping on Hennessy cocktails with names such as Avalanche, Alpine Berries and Carthusian Monk. The seasonal food offerings sounds pretty tasty too — anyone for raclette gratin, or waffles with hot chocolate and chantilly cream? 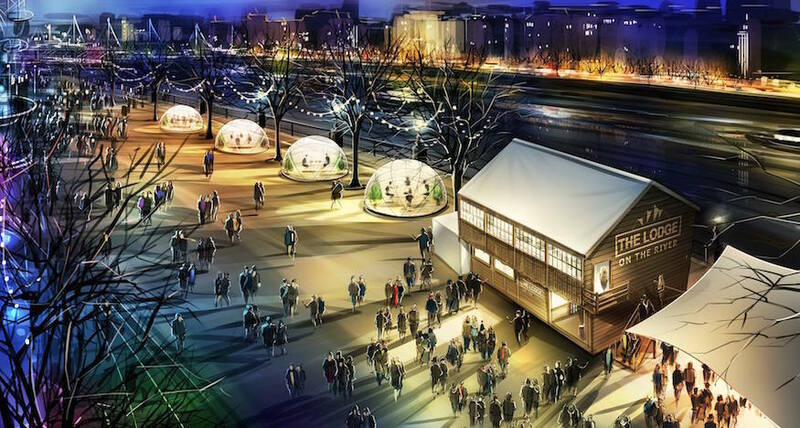 These pop-up festive igloos next to Tower Bridge have made a reliable appearance alongside the banks of the River Thames for the past few years, and therefore can justifiably be held responsible for kickstarting the winter igloo craze. Both drinking and dining can be enjoyed inside these transparent domes, with unrivalled views of the Thames, Tower Bridge and The Shard. They are extremely popular and bookings must be made in advance. This Christmas season, Londoners are spoiled with not just one, but two Pergolas on the Roof. 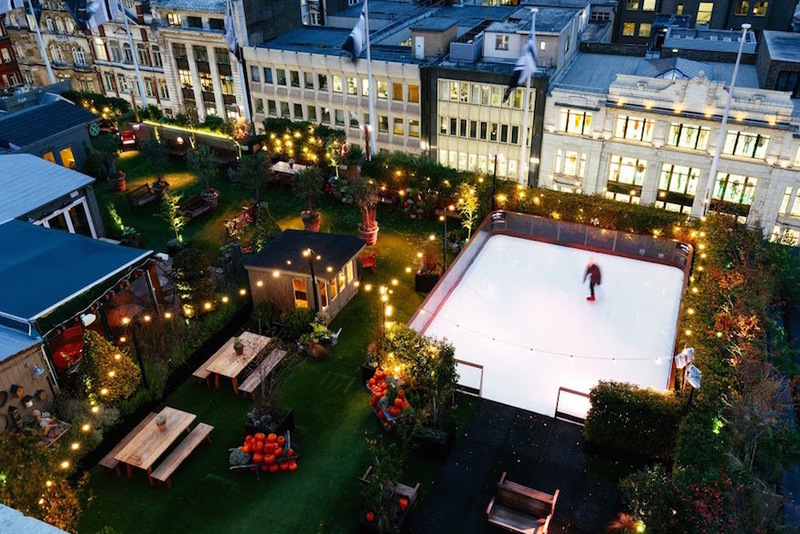 Now open in both Paddington and Olympia London, these rooftop oases are capitalising on their summer successes by turning their al fresco spaces into warming winter wonderlands. Boasting roof coverings and pumped full of heating, both venues are fine choices whatever the weather. You won't go hungry or thirsty either — both feature their own in-house bar plus a number of pop-up restaurants ranging from crab rolls to pizza, Vietnamese buns to French classics. Booking is advised, but 20% of tables are held back for walk-ups. Pop Brixton gets a little bit cosier for Christmas, with heaters, festive decorations and lights. The event space boasts all manner of food and drink traders, so whether it's raclette, jerk chicken or chocolate waffles that gets your festive vote, you'll find it here. The Magic Roundabout, Old Street - The bar and food stalls on top of Old Street stations are open throughout the winter inside a heated tent. With a South American-inspired decor, plus Asian BBQ-inspired food, it's a pretty international affair. It's its final year, as it'll be moving out for the redevelopment of Old Street Roundabout. Netil 360, Hackney - open Fridays and Saturdays throughout winter, with a fully-stocked rooftop bar and food courtesy of Hackney Pizza. 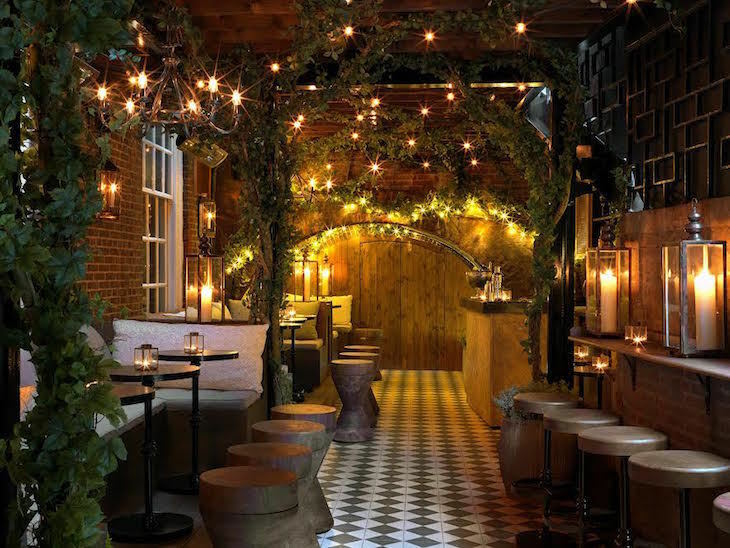 The Bloomsbury Club — The outdoor bar at The Bloomsbury Club is heated, and decked with fairy lights, making one of its booths the perfect place to hide out from the winter. Aqua Spirit - Part of Aqua Kyoto restaurant, with views over Regent Street. Radio Rooftop Bar - Situated on the 10th floor of ME London hotel on Strand. The Rooftop at The Trafalgar St. James - Overlooking Trafalgar Square, with a special winter cocktail menu. Madison - On the roof of One New Change shopping centre, with close-up views of the dome of St Paul's Cathedral and an alpine winter theme that stretches to cosy tartan blankets and boozy hot chocolates. Boundary - Raclette and fondue are on the winter menu at this Shoreditch stalwart. Rumpus Room, Southbank - Part of the achingly cool Mondrian Hotel and with views right up and down the Thames, Rumpus Room's riverside rooftop bar is magic of a winter evening. Big Chill King's Cross - Big Chill is simply a rooftop spot to eat, drink and be merry. The cocktail list isn't huge but who gives a flying fir tree. It's reasonably priced and there are local beers on the menu. 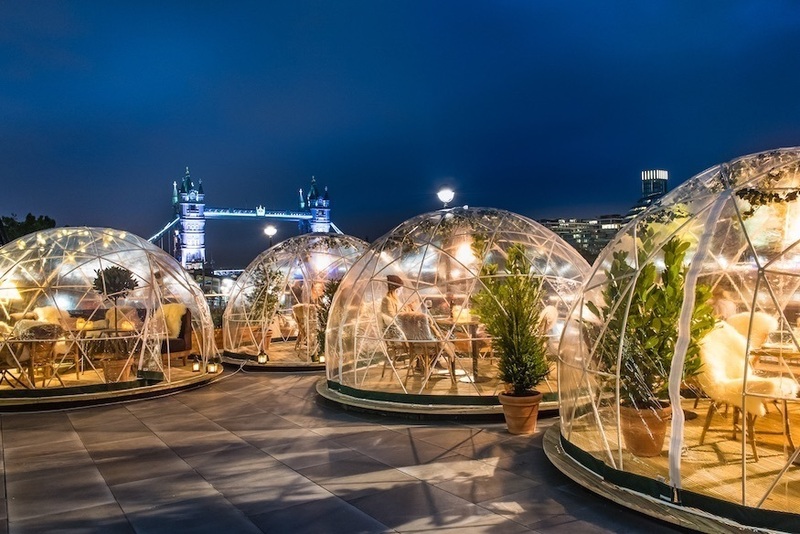 Aviary - The igloo trend continues at this swish rooftop restaurant bar in Moorgate. Expect killer skyline views from your private igloo, and a booking period that lasts until March.